If you live in or near Toronto (or want to go for a trip there), you can see an EARLY showing of the movie! "...While it will still be a work-in-progress when the ninth Sprockets Toronto International Film Festival for Children is running April 21-30, Over The Hedge is a coup because it is a potential boxoffice hit." Just so you know like how much it costs to go to this, it's like $20 for kids, and $32 for adults. But that does include three movies. Not bad ! You can check out their page for the movie by clicking here, and click the Festival's graphic on the top left to view their home page for ticket information etc. Check out the newest trailer by clicking here! Also there's a (small but growing) discussion forum for "Over the Hedge" at Yahoo! Check out what people are saying (and leave your own comments about the movie) here! AND there's going to be an "Over the Hedge" video game! I'm not really big on playing video games, so i couldn't really find ALOT of info on it yet, but it looks to be well on its way, so it should be released pretty soon. Maybe when the movie comes out in May ? Click here to see a bunch of screen shots from the game! 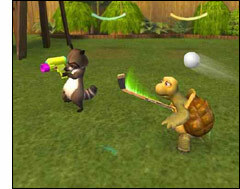 Here's a trailer video of the "Over the Hedge" video game! So that's all the latest news about "Over the Hedge"! So yep, thats all i have so far, but if i find anything else out i'll post it here, so keep checking in :) And look for my review of the movie when i see it !